A DualLiner isn’t just a great way to protect your truck bed – it’s also the best bedliner for RVs. The reason? The DualLiner offers certain key benefits that spray-in and drop-in bedliners just can’t match. Here’s the story. Installing a 5th wheel or gooseneck hitch in your pickup isn’t too complicated – you’ve got some frame brackets to install, some cutting, and then you’ll either mount rails and a hitch (5th wheel) or use a turnover ball (gooseneck). If you’re using a spray-in bedliner, you really need to get the hitch installed before you have a liner sprayed in. While the liner can certainly be cut if you’re adding a hitch after the fact, cutting into your spray-in liner will likely void the warranty. If you’re using a plastic drop-in liner, you’ll be cutting the liner to accommodate your rails or your ball. If you remove the rails, for example, you’ll end up with a bedliner that doesn’t protect two long strips of your truck bed, not to mention a discontinuity in the liner that makes loading and unloading more difficult, gives water and dirt one more place to get between your drop-in and your paint, etc. If you don’t need bed protection while your trailer is hooked up, you can simply remove the ZeroSkid® rubber floor whenever your’re towing. The rubber floor lifts up and out of the bed with ease. If you want to have bed protection while your hitch is installed, simply cut the ZeroSkid® rubber floor to fit around your ball or bed rails. Since DualLiner offers their customers the option to buy a second ZeroSkid® rubber floor, it’s a simple matter to switch out the rubber floor you’ve cut holes into with one that is just like new. That way, if you remove your hitch rails or flip over your ball, you can have a normal, regular bedliner. Only the DualLiner makes it easy to have a bedliner that’s both cut around your hitch AND that looks brand new when your hitch is removed. It’s not secret that rubber dampens vibration and absorbs sound. It’s also not a secret that a big, empty metal box (like a truck bed) is sort of like a loudspeaker. Whatever sound or vibration that enters your truck bed is going to be amplified without some sort of sound absorbing material. Enter the DualLiner’s 3/8″ thick ZeroSkid® rubber floor, which is capable of muting a great deal of road and exhaust system noise. While this might not seem like a big deal, reducing road noise is a great way to lessen fatigue during a long drive. If you’re an RV’er driving hundreds of miles a day, even a slight reduction in noise is worth considering. If you spend any amount of time using a truck for towing, hauling, etc., odds are good you’re going to have to get down on your knees inside the truck bed from time to time. 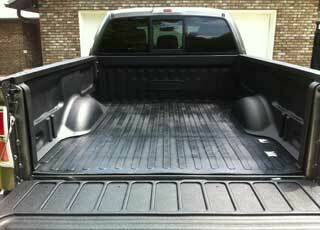 If your truck bed is sporting a hard plastic coating, your knees are going to feel it. But if the floor of your truck’s bed is covered in thick, soft rubber, you can kneel for extended periods without a problem. Whether your bolting in or removing a hitch, flipping over a ball, or loading or unloading your truck bed, being able to kneel down on the bed is kind of a big deal. The DualLiner is far superior to spray-in and drop-in liners in terms of everyday usability. While there are lots of other great reasons to buy a DualLiner bedliner, we hope that anyone pulling an RV will give the DualLiner serious consideration. Previous story Spray-In or DualLiner, Which is Best for Worn, Damaged Truck Beds?